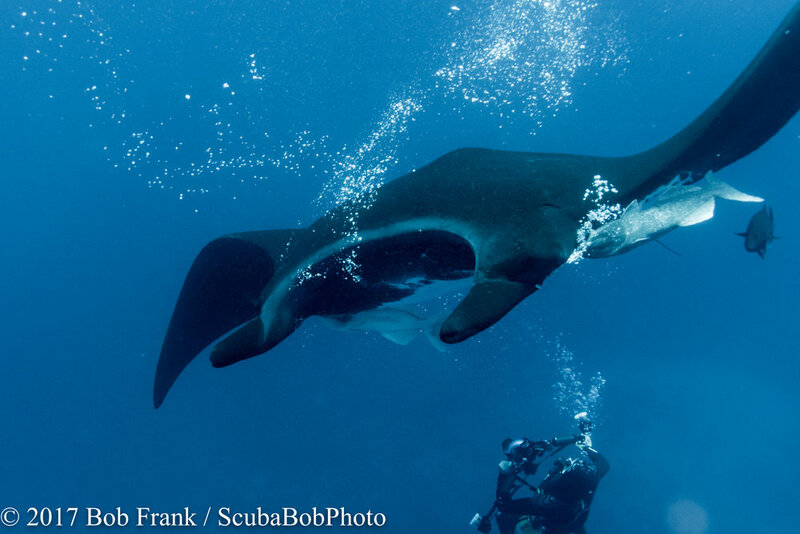 John Holden and I went on a dive trip to Socorro Island from February 3-12. Socorro Island is part of the Revillagigedo Archepeligo located about 250 miles west southwest of Cabo San Lucas, Mexico. (That's 24 hours by boat to the first island and another 10 hours to Socorro.) You go there to dive and see big things (apex predators) as there are very few reefs to dive so there are not a lot of colorful fish. On our trip we saw Pacific Manta Rays, Southern Rays, White-tipped, Galapagos, reef, silky and silver tip sharks, octopus, gigantic lobsters, moray eels, bottlenose dolphins and more. To say that it was an impressive trip is the understatement. Most people go there to see the Manta Rays and pray for the whales. (We could only snorkel with the whales and John and I were diving when the whale trip was going on so we missed it.) 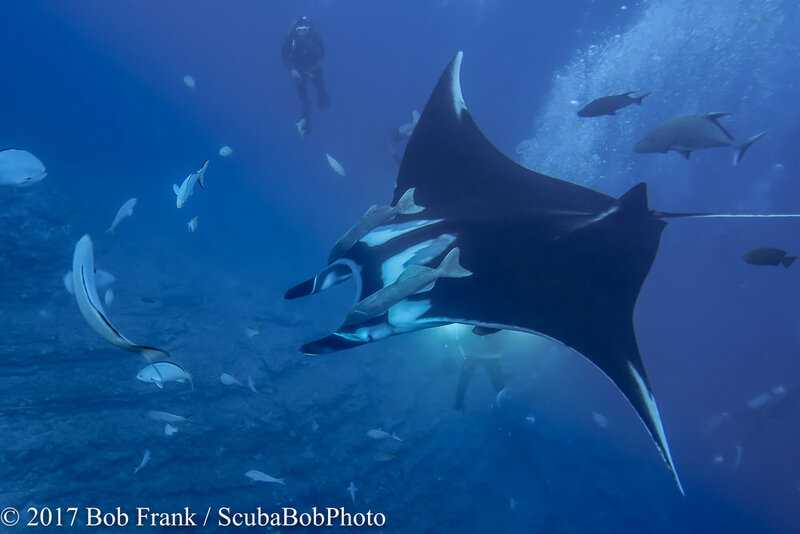 We saw mantas every day and as many as 8 in one dive and 5 at the same time. 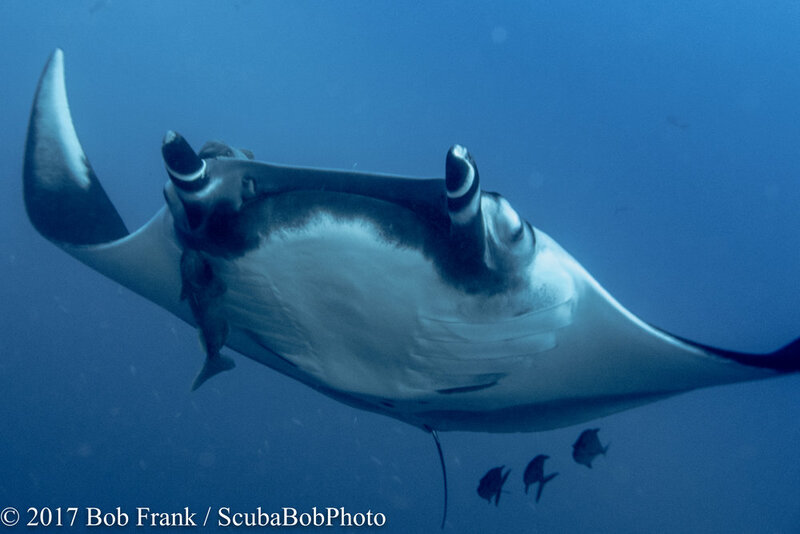 Mantas (like other fish) go to "cleaning stations" in the ocean where small fish, crabs and shrimp of certain species "clean" microorganisms, parasites, dead skin, etc. from the bodies and teeth of bigger fish such as apex predators. You will see these cleaner fish in the photos and videos. Many are Clarion Angelfish and I have included a photo of one of these orange beauties. 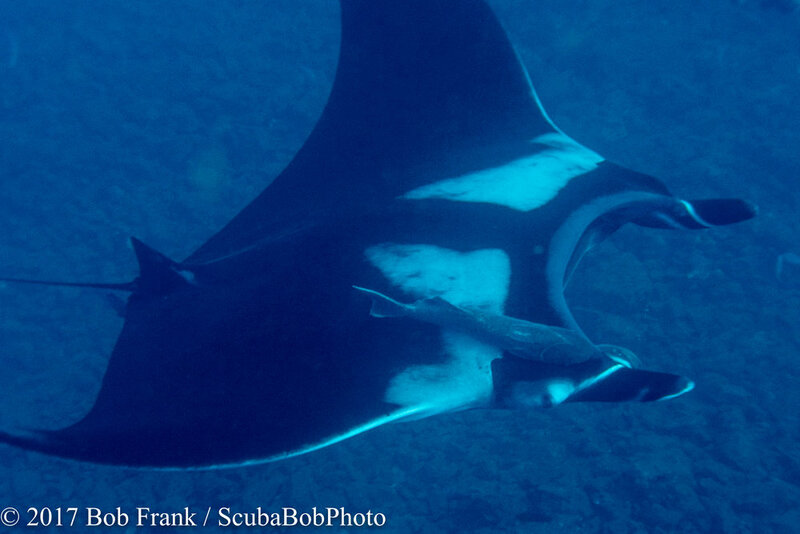 The manta rays seem to enjoy the diver's bubbles rolling across their bellies and scientists think that this may be a form of cleaning or massage for the rays. Regardless of the reason, if rays were not present when we entered the water they would usually show up within 10 minutes and would float around the divers going from one bubble stream to the next. It was an amazing acrobatic experience and the videos capture it better than do snapshots. You literally were eyeball to eyeball with the rays. Rays are born with the wings folded but quickly open to 3 feet in width. The rays we saw ranged from 12-16 feet wide but in the Galapagos Islands I saw Pacific Manta Rays that were 22-24 feet across. They are filter feeders so they feed on plankton--just like the whale sharks. 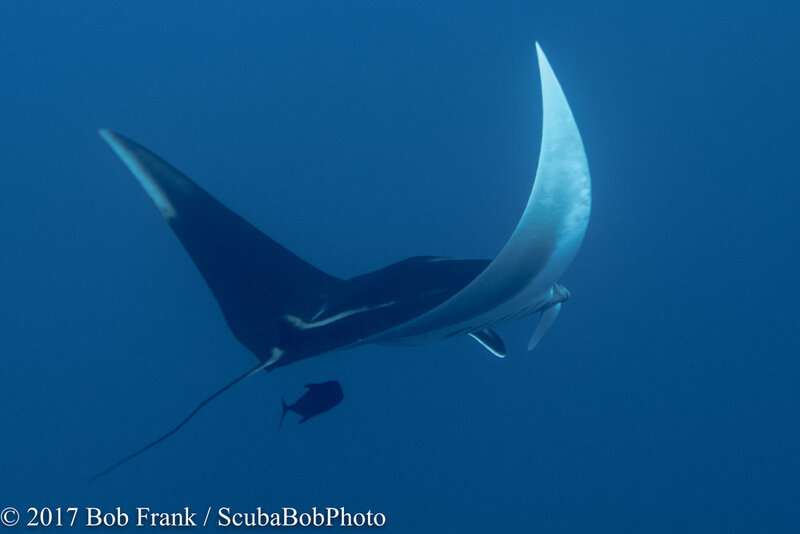 Scientists do not know how long Manta Rays live but it is estimate that they live for at least 30-40 years. Adults have no predators. You will see long eel like fish on the Ray's fins. These are Remora and they are hitchhikers. They have a sucker on the underside of their chin and they attach to the Ray for transportation. They do no harm to the ray nor do they benefit the ray. Remora are also filter feeders. Scientists do not know at what age after birth a Remora will join a ray but they appear to join for life. Sadly, I can't upload my videos to this web site. 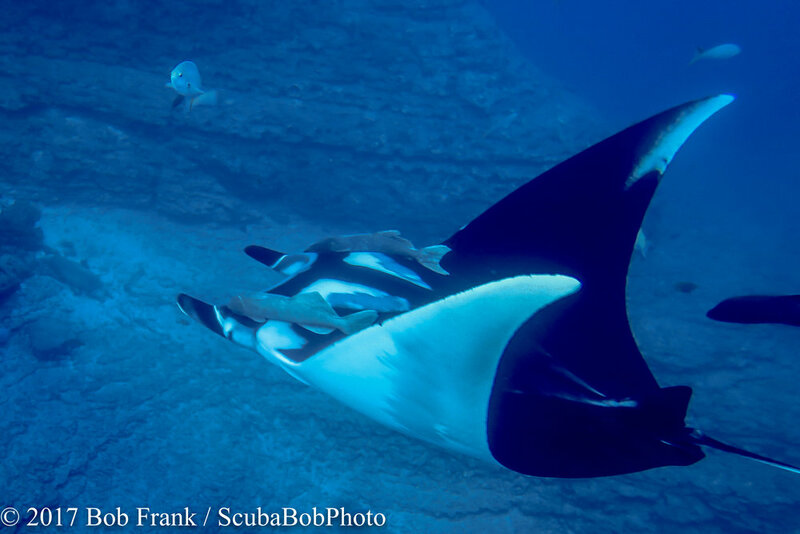 But if you want to see two really cool videos (octopus and manta rays) please visit my Facebook page: scubabobphoto.